R-value is the measure of the thermal resistance of a material or component and also one of the biggest gimmicks in the construction industry. A sales person can tell you a wall has a certain R-value but never mentions to you at what temperature the R-value being based on or how much air infiltration (leakage) there is through the wall. 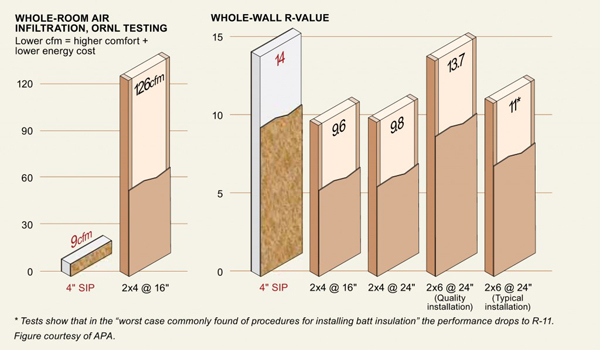 Typically fiberglass insulation in traditional framing states R-value is a “R-13” or “R-19” but that R-value was measured at 75 degrees. Fiberglass batt insulation gets its R-value through trapped air which means when the temperature drops, so do the R-values. Studies conducted by the Department of Energy’s Oak Ridge National Laboratories show that as outside temperatures get colder, the R-value of fiberglass insulation decreases. Using a full scale climate simulator, ORNL tested loose-fill fiberglass attic insulation rated at R-19 at a variety of temperatures. When outside temperatures dipped to -8°F, the R-19 insulation performed at R-9.2. What is more surprising was that infrared imaging revealed convective currents inside the fiberglass insulation. Warm air from inside the house would rise through the insulation, lose heat by coming in contact with the cold attic temperatures, and drop back through the insulation, forming a convective loop of constant energy loss. Click here for the Whole Wall R-value study. In contrast, the rigid foam insulation used in SIPs actually performs better in colder temperatures. Expanded polystyrene with a stated R-value of R 3.85 per inch at 75°F was tested at R-4.17 at per inch at 50°F and R-4.4 per inch at 25°F. More importantly, because all types of SIPs have solid insulation completely enclosed with wood sheathing, they are not subject to any convective currents like fiberglass insulation. Lamit Structural Insulated Panels (SIPs) utilize expanded polystyrene (EPS) for the cores of our SIP Panels. Expanded polystyrene has a stated R-value of R 3.85 per inch at 75°F, R-4.17 at per inch at 40°F, and R-4.4 per inch at 25°F. This is why our 4 ½” SIP Panel will outperform a stick and batt 2x6 wall with “R-19” insulation because of our increased R-values and superior air tightness. In homes built today, it’s the hot or cold air flowing into the home through the walls that make our homes hot or cold. If you stop that airflow with a solid EPS foam core found in SIP’s, it makes your home Super Energy Efficient and reduces your heating /cooling costs by 50%-70%. See chart below.